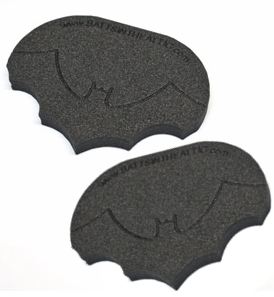 For years domestic machine quilters have enjoyed using our Batt Scooters to help them get a good grip on their quilts as they maneuvered them under the needle. In Paula's traveling and teaching, she has noticed more quilters using larger, table-mounted, longarm machines. These Super Scooters are a perfect match for the larger space that these machines have. Simply place the Scooters on your quilt with the pointy sides facing each other, then cover them with your palms and fingers, leaving your thumbs on the quilt fabric. You will be amazed at how easily you can move your quilt with these!